Here at Santry Motor Sales we aim to ensure that our customers enjoy a stress free experience from initial assessment through to final handover of their repaired vehicle. We have a recovery service which recovers vehicles and will bring them to the workshop at a time most convenient to you. 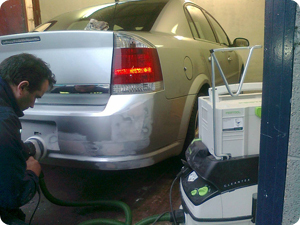 As the preferred collision repairer of most insurance companies. We will ensure that your insurance claim is looked after in the most professional and timely manner. Our body shop is equipped for all jobs. Small dents, re-sprays and major damage repair. We promise top quality work carried out by our experienced staff that will produce first class crash repair.